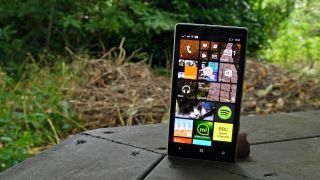 Since acquiring Nokia in full last year, Microsoft has yet to release a flagship handset to take on the big guns in the market – but it looks like that's finally set to change. Rumours suggest the Lumia 940 and 940 XL are in the works and may be announced at an October 19 event in New York. That same event is also rumoured to be the reveal for the Surface Pro 4 as well as the Microsoft Band 2. NokiaPowerUser has supplied some of the specs for the larger phone suggesting it'll have a 5.7-inch, 2560 x 1440 display with an octa-core Snapdragon 810 processor under the hood and 3GB of RAM. The design is said to be polycarbonate, like we've seen before on the Lumia range, and will come with 32GB of internal storage, a 20MP PureView rear camera, 5MP front facing camera, and an Iris scanner for unlocking the phone. There's also a suggestion there'll be a USB Type-C port at the bottom and Native Pen support for the stylus that comes with the Surface Pro tablet range. Take this one with a truckload of salt – we'll have to wait for a few more weeks to find out if any of it is true. Everything on the Surface Pro 4 so far.